Recent impact experiments showed the influence of a strong or weak interface in a bi-layered PMMA material has on dynamic fracture mechanisms. We show that a linear elastic with brittle damage peridynamic model, which works very well for glass, leads to crack propagation speeds significantly faster than those measured experimentally in the PMMA system. We propose an explanation for this behavior: localized heating in the region near the crack tip (due to high strain rates) softens the material sufficiently to make a difference. We introduce this effect in our peridynamic model, via a bi-linear bond force-strain relationship, and the computed crack speed matches the experiments. 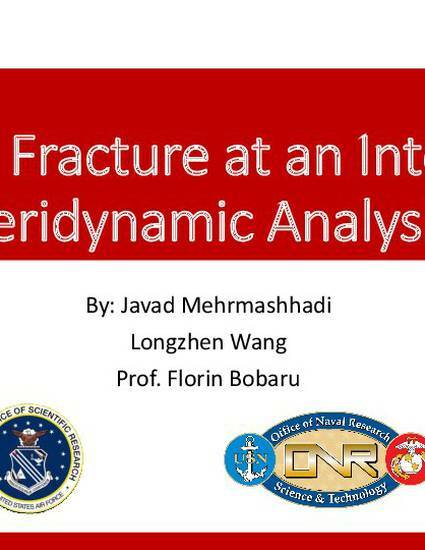 We perform a detailed peridynamic analysis concerning the effect a strong or weak- interface in the bi-layered PMMA system has on how long the crack runs along the interface before penetrating in the second layer. The computed crack paths follow very closely those found experimentally. The proposed model seems to explain the observed behavior.